A starving and weak kitten is rescued from the streets of New Delhi by none other than the Dalai Lama. This is her story ... the cat with many names, but known throughout the monastery and the neighborhood most adoringly as HHC, His Holiness's Cat. Seeing the Dalai Lama and his Buddhist teachings through the eyes of a kitten who is most concerned with the quality of the duck l'orange and whether or not the monks love Kye Kye, a dog they are fostering, more than her, is quite delightful! HHC understands all conversations, knows who the famous visitors are, and is endlessly intrigued by the goings-on of the monastery. It is fun to see this all through the eyes of a beloved cat. You don't have to read far into this book to realize it isn't really a novel about a cat. It is actually a presentation of some of the most important Buddhist wisdom through the author's use of a very smart cat. 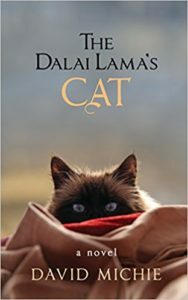 I felt a bit duped by the front cover which clearly calls The Dalai Lama's Cat a novel. It is, in my mind, creative nonfiction. Nevertheless, I am happy to have this gentle introduction to Buddhism. This book appeared under my Christmas tree at the Tree Already Trimmed book swap, but the note inside did not indicate who left it there. It's an easy and enjoyable read ... IF you want an easy entry into Buddhism. Sounds good. Added to my list. What a delightful book! Yes, a gentle introduction to Buddhism. I wonder if a reader isn’t a cat person — been around cats, know their personalities – would they appreciate HHC’s story as much a cat lover would. This was a fun, relaxing read that also caused me to pause more than a few times to reread and reflect. Thanks for the review that spurred me on.